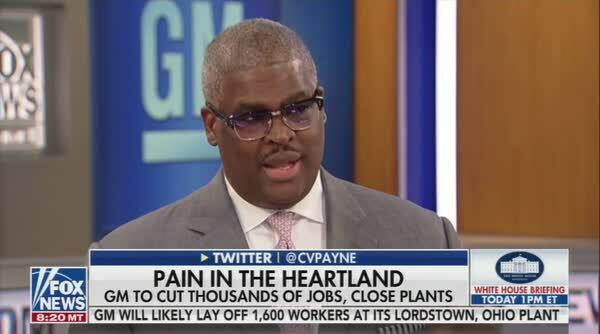 Fox Business Networks' Charles Payne was outraged that GM was dumping 14K U.S. workers after scoring huge profits. But rather than looking at the policies of the past eighteen months and the president who promoted them, Payne worried that capitalism is in trouble because the American public is going "to get hip" to their "shenanigans" and will elect socialists instead. Payne joined Tuesday's America's Newsroom on Fox News and discussed GM's decision to dump 14K employees and shut down several plants. Payne said even though GM's volume went down by 10% in North America, they had record positive net income, record earnings and record selling prices. "Americans are keeping you in business and you are kicking them to the curb." When haven't big corporations acted this way? Free market fanatics, like most pundits on CNBC, Fox News and FBN have pushed the myth that trickle-down economics is real. Progressives have been screaming at the top of our lungs about this destructive nonsense for decades. Payne became very negative for a FBN pundit, too negative for Bill Hemmer anyway. Payne said, "And again, it's not like they're in dire straits. Now, they're trying to get ahead of things, they want a big fat cash flow. But this is why, I think, capitalism in and of itself is in a lot of trouble in the country. Because, you know, these companies keep posting record earnings and they keep firing people. They keep posting record earnings and they keep buying back billions of dollars of their own stock. This is what happened after the Trump tax cuts were passed. The workers didn't see the corporate cash, the shareholders did. Charles continued, "The American public is going to get hip to this and my fear is that they're going to end up electing, not a democratic socialist, just a straight-up socialist because of these kind of shenanigans. They should have seen this coming a long time ago." Bill Hemmer quickly moved off this topic. Because the suits at Fox won't have that kind of talk! Conservatives have been able to hide as well as they could to the American people what actually happens when it comes to the very wealthy getting their cash and the working class that doesn't. They want the working class to feel so grateful when they receive a couple hundred dollars after corporations take home billions. The Washington Post's Wonkblog analysis has great information about how corporate America is raiding the working class. In percentage terms, the two rose roughly in tandem from 1947 until about 2003 (the chart is indexed to the year 1954, which the Federal Reserve considers “postwar” for economic purposes). But starting in 2003, profits take off, leaving wages in the dust. The Great Recession took a bite out of corporate profits, but since about 2009, profits have been on an unstoppable tear while labor's income has remained virtually stagnant. I believe why the Paynes of cable news are so angry is because GM exposed their fantastical lies that tax cuts are the be all and end all for the economy. It's difficult explaining tax policy and economics to many Americans because it is pretty complex. GM made it simple. GM has huge profits, gets a huge tax cut from Trump, pockets the money via the stock market, and fires workers. Not at all complicated. Now Americans have hard evidence the Trump tax cuts are a sham.